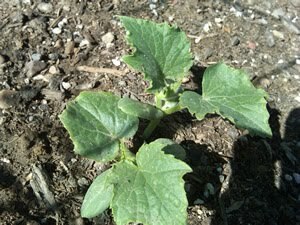 There are no cucumbers on the vine yet, but this blog has helped me observe the garden as it grows....so today I am sharing pictures of the cucumber plant growing. It all started on May 25 when it was planted into the community garden. 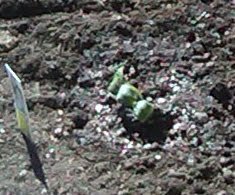 I did not take a picture of just the plant---this is cropped from the picture I took of the entire department plot. In two weeks it began to add more leaves. It only had two little ones when it started. Three and a half weeks later (or five and half from planting) it is starting to spread out and it looks like it is sprouting a few flowers (or maybe it is sprouting more leaves to spread). 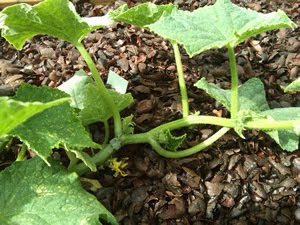 I wonder how long it takes to get cucumbers on the vine?